Selma Fraiberg planted the seeds for psychoanalytic infant-parent work over 40 years ago; since then, contemporary efforts have been deeply enriched by developments in infant research, relational psychoanalysis, as well as attachment and mentalization theories, with their particular focus on affect regulation, intersubjectivity, and intergenerational transmission of fear and trauma. This presentation will include a discussion of the theoretical frameworks of a reflective parenting approach, including a detailed description of parental reflective functioning, a description of the fundamental aspects of mentalization-based infant-parent work, and a summary of a randomized clinical trial and preliminary findings. The processes whereby clinicians observe and evaluate a parent’s reflective capacities, and engage parents in becoming more reflective and sensitive in their parenting will be addressed. This will involve an in-depth look at what parental reflective functioning looks like in the clinical situation, as well as a discussion of case material and clinical vignettes demonstrating clinical strategies for working with breakdowns in mentalization. Finally, a discussion of a reflective home visiting program Minding the Baby®, will provide a clinical illustration of these principles. MTB is an interdisciplinary home visiting intervention that engages mothers before they give birth, with the goal of interrupting cycles of traumatizing, disrupted interactions, and developing more attuned interactions that culminate in a more secure attachment and appropriate development. Register before April 1, 2019, and receive $99 early-bird pricing! Price increases to $115 after April 1, 2019. 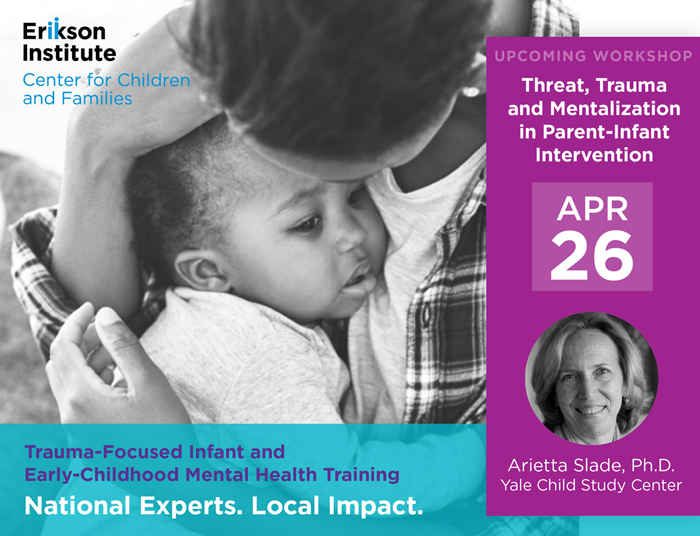 Arietta Slade, Ph.D., is Clinical Professor at the Yale Child Study Center, and Professor Emerita, Clinical Psychology, The City University of New York. An internationally recognized theoretician, clinician, researcher, and teacher, she has published widely on the development of parental reflective functioning, the implications of attachment theory for relationship-based infant mental health practice, as well as clinical work with children and adults. For the past 15 years she has been co-directing Minding the Baby®, an interdisciplinary reflective home visiting program for high-risk mothers, infants, and their families, at the Yale Child Study Center and School of Nursing, one of only 19 certified “evidence-based” home visiting programs in the United States. Dr. Slade is editor, with Jeremy Holmes of the six volume set, Major Work on Attachment (SAGE Publications, 2013), with Elliot Jurist and Sharone Bergner, of Mind to Mind: Infant Research, Neuroscience, and Psychoanalysis (Other Press, 2008), and with Dennie Wolf, of Children at Play (Oxford University Press, 1994). She has also been in private practice for thirty-five years, working with individuals of all ages. 1. Participants will be able to describe the relationship between fearful arousal and attachment. 2. Participants will be able to describe the impact of trauma on mentalization. 3. Participants will be able to define and identify instances of parental reflective functioning.